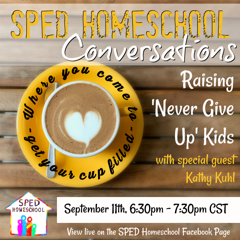 In September 2018, Kathy discussed “Raising Never-Give-Up Kids,” with Peggy Ployhar at SPED Homeschool Conversations. Watch the replay at the last link, or download the podcast here. 2017 Online Homeschool Convention. Kathy’s talk, “Understanding and Helping Our Struggling Learners,” is one of dozens of workshops given by an excellent group of speakers. Buy lifetime access the Online Homeschool Convention and part of your ticket will support Kathy’s work. Thank you. On May 2, 2017, Kathy gave a webinar on “Homeschooling Children with Special Needs” for PEATC of Virginia. (Our apologies for the sound quality.) She explained how to customize curriculum, schedule, and plan for your child’s unique strengths, weaknesses, and interests. Kathy gave suggestions on finding materials and getting support. Also she discussed how to decide whether students need special testing to identify learning problems, and about helpful resources, and mistakes to avoid. This webinar can help you, whether you are looking only for after-school and summer enrichment, are considering homeschooling, or have been homeschooling for years. On March 22, 2017, Kathy spoke on “Life Skills for ADHD Teenagers and Young Adults,” online, free at Attention Talk Radio, or listen by clicking on the frame below.Sign up for Kathy’s email newsletters here. For even more from Kathy, sign up for weekly blog updates here. On December 1, 2016, Kathy spoke on “Lessons Learned by Homeschool Families that Can Help All Students,” on the ADHD Expert Podcasts and Webinars, hosted by ADDitude Magazine. Replay the webinar here. Kathy has also given five workshops for HECOA, the Home Education Council of America. HECOA events can be listened to live or within 24 hours with free basic membership. 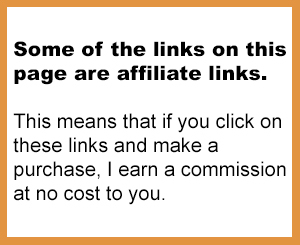 Paid members can listen indefinitely. Florida Parent Educator Association Special Needs Conferences 2014 and 2017. Kathy loves to talk with parents at events around the world, including major homeschool conventions and conferences. She has spoken at FPEA (2014), HEAV (2012 & 2013, 2016), CHAP (2009, 2013), Midwest, SouthEast, Texas, California, and Missouri Great Homeschool Conventions (2011-18), LEAH (2011 & 2013), FEAST (2013), WHO (2015), TEACH-CT (2011), ENOCH (2010), NCHE (2009), VAHomeschoolers (2009, 2013), GiftsNC (2007, 2008), Kaiserslautern Military Community (2010), SHARE (2012, 2013, 2015, 2017) among others. Kathy promotes homeschooling by speaking at national conferences. She’s presented at the Learning Disabilities Association (2009-2012), CHADD (Children and Adults with Attention Deficit/Hyperactivity Disorder, 2007, 2009), the Autism Society of America (2008), and the Diamonds in the Rough Conference: Smart Kids Who Learn Differently (2010), among others. She also speaks to smaller groups of education professionals. Kathy also enjoys speaking at women’s retreats. Though accustomed to speaking to parents from many different backgrounds and beliefs, she enjoys speaking on hope, encouragement, and other Biblical topics. She has been a member of New Hope Presbyterian Church (PCA) since 1997, and is an alumna of Intervarsity Christian Fellowship and Young Life.